Windows 7 experience Index Data transfer rate is low | Its Madh !!! Many people facing low Hard disk experience index (Data transfer rate) rate , which was higher in Windows vista. It can be solved using easily. Control Panel -> Hardware & Sound -> Device Manager. Under Disk Drivers, Choose your hard disk. On the Policies Tab, Uncheck "Enable writing cache on this Device "
Now again Re-run the experience index assessment from Control panel -> Performance Information and Tools. This method will work on most cases. I improved my rating from 2.0 to 4.9 !!! 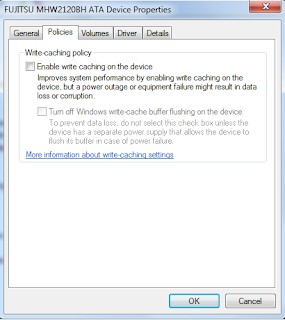 It is better to Re-enable cache settings after running the test. You will get better performance with cache enabled. It wont hurt again your WEI score .